Paradis Interdit: created in 2011, exclusive, limited edition. To compose the new perfume, Thierry Wasser, drew his inspiration from the book of formulas containing the secrets of Guerlain perfumes for over 180 years. Forbidden Paradise, a name loaded with wonders and mysteries. 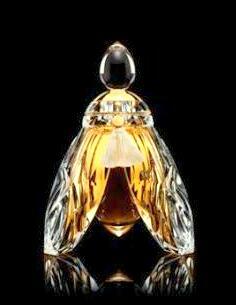 The 245ml Baccarat "L'Abeille Aux Ailes Or" flacon bottle features beautifully hand painted 18 carat gold wings, only 57 numbered pieces are produced and sold worldwide, for $25,000 US dollars.